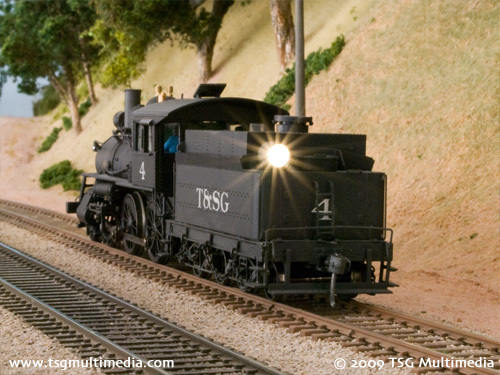 As much as I strive for accuracy when I am making a model of a real locomotive, there is a part of me that loves to freelance. 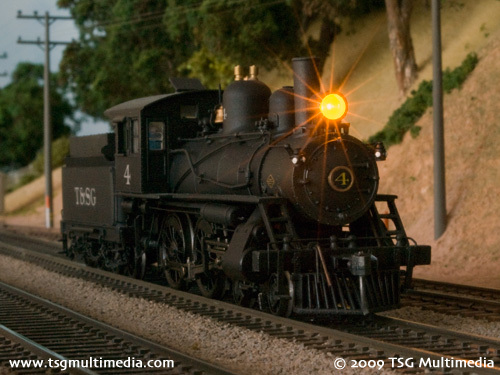 The Bachmann Spectrum steam engines are great for freelancing, and they generally run pretty well. I decided to letter my 4-4-0 for our fictitious Tuscany & Sabine Grove. 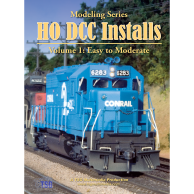 Since I model the 1990s in HO, T&SG No. 4 is an excursion engine, used for hauling tourists and railfans over the picturesque shortline. On the DVD I show how I installed an ESU LokSound decoder and speaker in the tender. No modifications were required on the locomotive itself. 1 (address) 4 This is the locomotive’s address. 3 (acceleration) 28 This controls how quickly the locomotive changes speed when accelerating. 5 (top speed) 31 This controls the maximum voltage applied to the motor at full throttle. 6 (mid speed) 16 This controls the voltage applied to the motor at half throttle. 53 (control reference) 36 Reducing this value from the default has the effect of lowering the starting speed of the locomotive (though it is still good with the default value). LokSound decoders are great at low speed crawling, making for amazingly smooth starts and stops. 57 (chuff rate) 50 This controls the chuff rate, which for most steamers should be four chuffs per driver revolution. I have found that LokSound decoders do an excellent job in this regard, and stay in sync well throughout the speed range. 61 (random sound min) 0 This controls the playing of random sounds, like coal shoveling, etc. I set CV61 and CV62 to 0 to disable this feature, as I found it annoying. 121 (volume) 64 This is the whistle sound volume. 122 (volume) 36 This is the bell sound volume. 123 (volume) 30 This is the auxiliary sound volume (steam chuffs, brake squeal, and everything else). 172 (F5 button forward B) 1 Setting this variable to 1 prevents the locomotive from slowing down when dynamic brakes are turned on with the F5 button. This really doesn’t do anything on a steamer, but I set CV172 and CV175 the same way on all my LokSound 3.5 decoders. After we’d finished filming the decoder installation on this model, I decided to change the original front headlight LED and add a backup light on the tender. Though I have been overall very pleased with this locomotive, I was unhappy with the factory LED headlight because it was orange and looked nothing like any steam engine headlight that I had ever seen. I started by removing the screw that holds the smokestack to the boiler. These Bachmann Spectrum locomotives can be a pain to disassemble, and since this one runs really well, I didn’t want to mess with it too much. I decided to try to perform the swap externally so that I would not have to take the locomotive apart. I simply cut the two leads on the back of the headlight, making sure to leave some metal sticking up so that I would have a place to solder new connections later. I reused the Bachmann headlight casting on the front. For the new rear light, I used a Cal-Scale Santa Fe style casting. 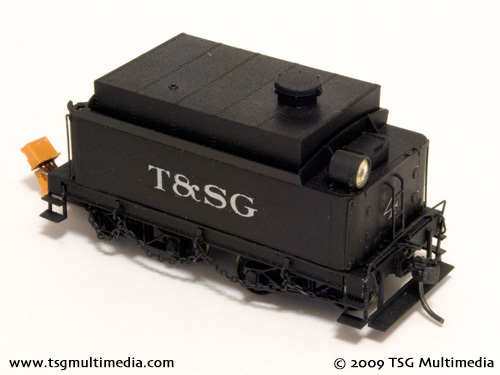 The Santa Fe headlight is similar in size and shape to the Bachmann casting. 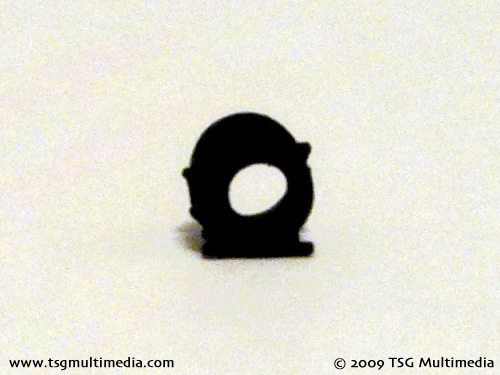 The Bachmann casting already had a pair of holes for the LED leads. On the Cal-Scale part, I drilled out the back completely, using a drill that matched the diameter of the 3mm LED. I used “golden white” LEDs front and rear. To make the LEDs fit better, I filed off the rounded front, leaving a flat surface and shortening the overall length. This will not hurt the LED unless you go too far and hit the metal parts inside, though filing away too much material can alter the color. The front headlight already had a clear plastic “lens”, but the Cal-Scale casting just has a hole. I used an MV lens to fill it. To let light through, I carefully drilled through the foil on the back of the lens, using a drill bit held in my fingers and working slowly so as not to drill all the way through the lens. I used some artist’s acrylic gloss medium to coat the inside of the hole to remove the roughness left by the drill. This is the assembled rear headlight. 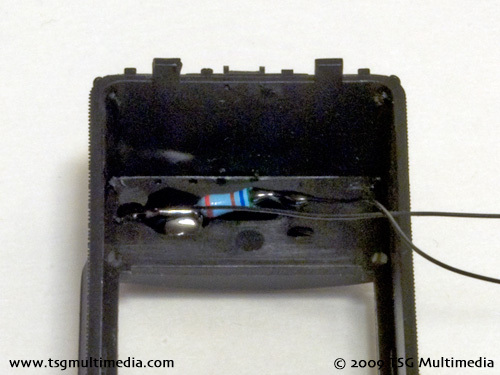 The back of the LED was fit flush with the back of the drilled-out casting and then painted black. 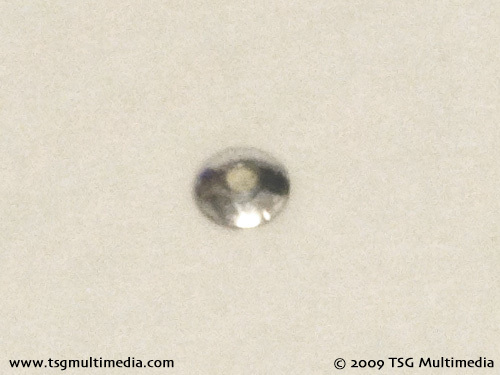 The lens was secured to the front of the casting with a little gloss medium. Thankfully the Bachmann tender comes apart pretty easily. Even though I had already installed a decoder and speaker, it did not take too much effort to remove the shell. I chose to mount the headlight offset to one side since there is a filler hatch in the middle at the back of the tender. I have seen prototype locomotives with offset rear headlights, probably done for similar reasons. I drilled a hole and fed the wires through the tender deck and glued the headlight casting in place. I installed a resistor on one of the wires. 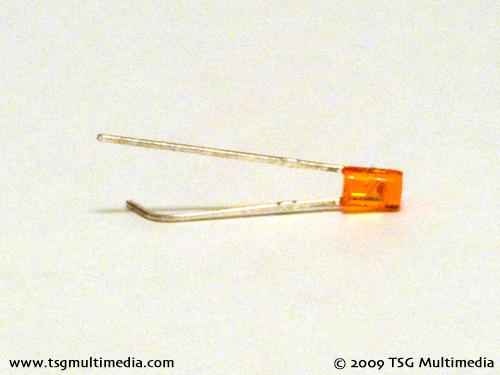 Even though LEDs are polarity sensitive, it really doesn’t matter which wire you use for the resistor. The shiny black stuff on and around the resistor is liquid electrical tape, a precaution against any potential shorts. Once I had the light mounted, all I had to do was connect the wires to the decoder and reassemble the tender. When using LEDs with DCC, if they seem to not work at first, try reversing the wires. 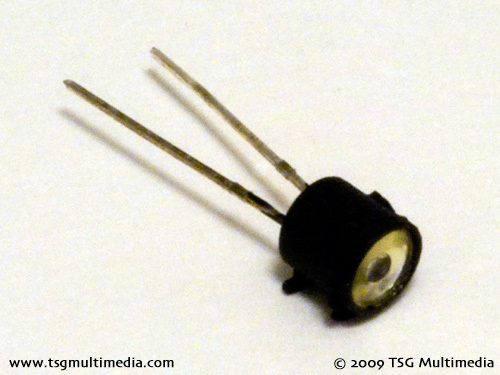 The polarity has to be correct for the LED to light. 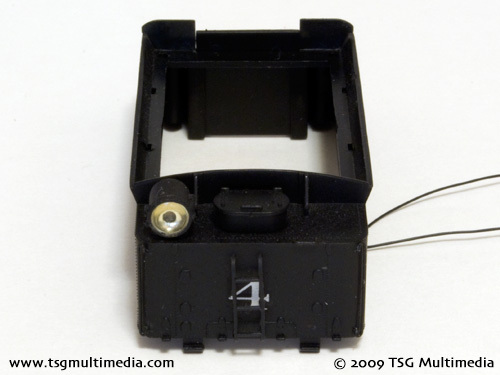 It should not damage the LED or decoder if it is connected backwards. It just won’t work. To reconnect the front light, I just soldered the LED leads to the stubs left over when I cut off the original light. Once these were painted black and the stack reinstalled, it was hard to tell anything was done. This is the completed tender. The new backup light looks really good. Now the Tuscany & Sabine Grove crews can see what’s behind them when making backup moves. The new front headlight is a much more believable color. 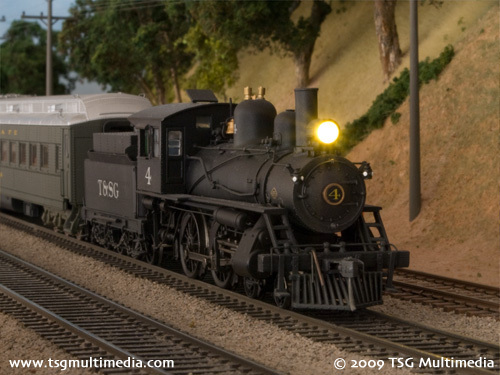 My experience with Bachmann Spectrum steamers is that they can be somewhat hit-or-miss when it comes to performance. 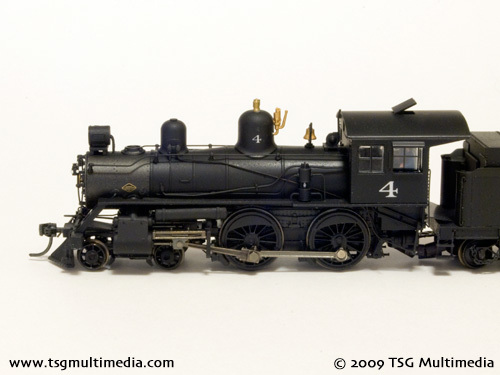 This is my only Bachmann 4-4-0, so I can’t say if it’s typical or not, but it is a very good runner, smooth and quiet. It does make a tiny bit of driveline noise when backing up, but it’s minimal and not very noticeable with the sound decoder going. As happens often with short-wheelbase steamers, the locomotive does stall sometimes. The pilot truck has no provision for electrical pickup, something that I may decide to remedy in the future. The tender has plenty of room inside for a sound install and the floor is pre-drilled with speaker holes. Another thing that I like is that it is possible to synchronize the steam chuff sound to the driver rotation very accurately without a cam. Some sound decoders will synchronize at one speed, but get out of sync when the locomotive goes faster or slower. The LokSound does a really good job of staying in sync. I set mine up to work well in the lower half of the throttle range, as at high speeds it becomes difficult to see if the drivers are in sync or not anyway. 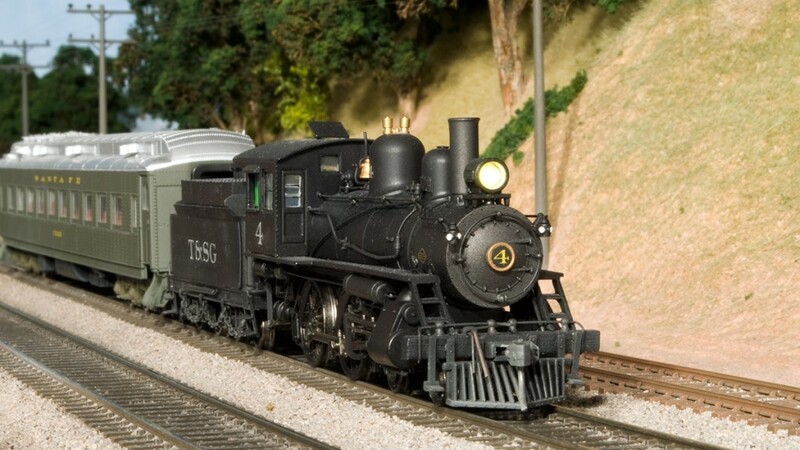 This decoder has nice whistle and bell sounds, and I like the way that the steam chuffs hiss for the first few rotations when the locomotive starts moving. Very authentic!